Orienteering is a sport where people run around an area to certain control points given on a map. There are lots of types of orienteering and the most popular type in Britain and the US is called Foot Orienteering. In orienteering people use a special map which shows where they have to go and in what order. People are timed and the person who is quickest wins. The word Orienteering comes from orientering, which is a word that comes from Sweden. Orienteering is developed by International Orienteering Federation (IOF). Orienteering started in Sweden. It was meant to get people in the army to get ready for war. The first large orienteering event was when 220 people went orienteering in a place near Stockholm. About sixty years ago, people started orienteering in Europe, Asia, North America, Australia, and New Zealand and in 1967 a group of people started to meet up in the United States of America to make an orienteering club. There are now orienteering groups for 67 countries. Foot-Orienteering is one of the IOF recognised orienteering types. The athlete covers the distance of his course only using his feet. The IOF organises World Orienteering Championships (WOC) every year and the European Orienteering Championships once every two years. The first WOC was held in 1966 in Finland. Only 10 nations took part in the first WOC. Mountain bike orienteering or MTBO that you can say is a sport where you cycle through the forest on small paths and trying to find the controls. In the year 1996 some people decided to start to try to have orienteering as a sport in the Olympic games. It has yet to become a sport in the Olympics. Orienteering is also done as a life skill. It is used in training of many countries' armed forces. Often, soldiers have to do orienteering courses at night or in the rain. Orienteering is also part of Scoutcraft in many branches of Scouting. Many Scouting groups require learning orienteering to make higher ranks. ↑ Palmer, Peter (1997). The Complete Orienteering Manual. Wiltshire, England: The Crowood Press Ltd., ISBN 1-86126-095-4, p. 19. 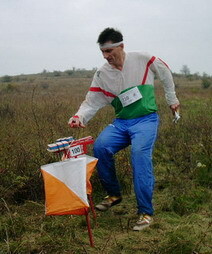 ↑ 2.0 2.1 International Orienteering Federation (2006). National Federations. Retrieved February 19, 2006. ↑ Boga, Steven (1997). Orienteering: The Sport of Navigating with Map and Compass. Mechanicsburg, Pennsylvania, USA: Stackpole Books. ISBN 0-8117-2870-6. p. 2. ↑ Kirk, Colin (2006). "History of the Canadian Orienteering Federation". Retrieved Ma, 2006. This page was last changed on 18 October 2018, at 20:49.